Over the last couple of centuries tonic water has been enjoyed with the alcoholic drink gin to create a refreshing and timeless cocktail. Interestingly, in its purest form tonic water has only two ingredients; water and quinine. Quinine (Figure 1) will be the molecule we shall be looking at carefully in this blogpost. Historically, unlike its modern use as a drinks mixer, tonic water had a more practical purpose due to its medicinal properties. With the exponential rise of Europeans moving to the tropics on imperial quests, malaria was a far greater threat to them than the anger of displaced indigenous peoples or local wars. Some estimate that, over the history of humankind, malaria has killed in excess of 54 billion people, over half the number of people who have ever lived on Earth! The colonial settlers therefore required a quick and easy medicine that would prevent the onset of this very serious and debilitating disease. This is where quinine comes in. It was discovered in the 17th century by missionaries in South America who ground down the bark of the cinchona tree. The resulting powder was consumed and found to have a plethora of medicinal qualities. The name quinine is an English corruption of the word cinchona. Later on it was purified into powder. The problem with quinine is that it is incredibly bitter in taste so it was mixed with water and sugar to make it more bearable. The gin came later on, when it was found that, if mixed, the two complemented each other well in flavour. This was ideal, as the British imperial troops had rather generous gin rations! It was not until after the Second World War that more efficient anti-malarial drugs were synthesised and the use of tonic water and quinine moved from medicinal to purely recreational use. Quinine’s has two main molecular building blocks which are largely responsible for its medicinal properties. The first, and most important, is quinolone which is a common precursor to many related drugs. 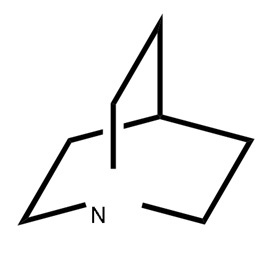 The second is quinuclidine (Figure 2), a bicyclic amine with strongly basic properties due to the lone pair of electrons on the nitrogen atom it contains. After quinine’s initial discovery, it was primarily utilized for its antipyretic and analgesic properties as a treatment for malaria. Antipyretic means it lowers a person’s temperature when they have a fever. Analgesic means it is a painkiller. It was soon discovered though it was also prophylactic (preventative) against malaria hence tonic water was drunk even if there were no initial symptoms. 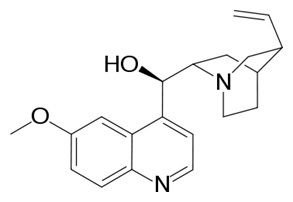 Quinine’s antimalarial mechanism of action is similar to that of another anti-malarial drug, a quinolone-based medicine called chloroquine. Quinine is a crystalline alkaloid that accumulates in the food vacuoles of the malaria parasites. Once it has infiltrated the parasite it goes on to inhibit the biocrystallisation of haemozoin. This causes a fatal build-up of free haem molecules (Figure 3) in the parasite which is extremely cytotoxic and will cause cell death. 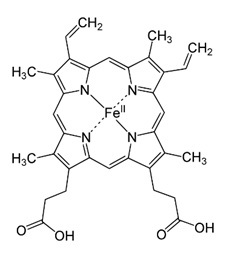 The toxicity is due to the iron atom contained within the haem acting as a Fenton’s reagent, which facilitates the formation of free radicals that can force certain cell types to undergo programmed death. Note, in humans it is proposed that there is a correlation between the high consumption of red meat and colonic cancer, due to the abundance of free haem molecules. However, further research is still needed on this area. The quinine in tonic water fluoresces, which is familiar to anyone who has visited a nightclub with ultraviolet (UV) or black lighting. 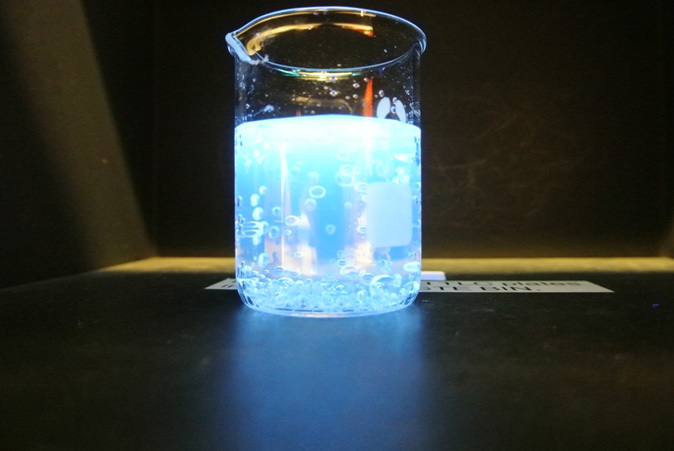 Quinine is so sensitive to UV light that it can visibly fluoresce even when exposed to direct sunlight. Fluorescence is defined as the emission of light by a substance that has absorbed light or other electromagnetic radiation. Fluorescence is not to be confused with phosphorescence. Fluorescent material will stop emitting light when the external light source is removed whilst phosphorescence requires a material to continue to glow after the external light source is removed, sometimes known as ‘glowing in the dark’. Picture of Quinine under UV light. The fascinating process of fluorescence is the result of quinine absorbing the high energy UV light photons. These photons are in turn absorbed by electrons in the ground state causing the system to excite electronically and vibrationally. Eventually, the excited electron must relax back down to its ground (singlet) state, and during this process the phenomenon of fluorescence occurs. The specific frequencies of the emitted light are dependent on the particular system; however, the emitted light is of lower frequency than the absorbed light. This explains why the emitted light is not normally the same colour as the light it has been exposed to. Unfortunately, a fluorescence spectrum of tonic water is not as good as one of quinine solution alone, due to it being fizzy (carbonated). So next time you see someone drinking a gin and tonic (a ‘G&T’), think about all the lives saved due to the compound giving its bitter taste. Huw Power, at the time of writing, is a final year undergraduate student in the School of Chemistry, University of Bristol, UK.